I’ve talked a lot about ATA RAID these last few months, but have left out an important aspect of fault tolerance. To accompany a hot swappable RAID card like the SuperTrak100, you need removable drive cages or chassis. 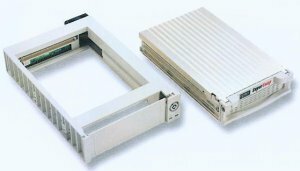 Promise has seen this need and released the SuperSwap Chassis, a lockable IDE removable drive housing. The SuperSwap comes in a fancy box with the following inside; a plastic drive housing, a steel drive cage, mounting screws and a small manual. The drive housing is screwed into a 5.25” drive bay and has a spring loaded flap to cover the opening when the drive cage is removed. The front has a key lock and two status lights for power and activity. The steel drive cage has a locking mechanism on the lid and has a cooling fan on the rear. Inside is a Molex power connector and an 80 wire 40 pin ATA drive cable. Installation is straight forward: connect your hard drive into the drive cage, screw it in place and slide it into the drive housing. Let’s answer the important question of why one would need this product. You’ve purchased a Promise RAID card and are using it for fault tolerance, i.e. in a RAID 1 or 5 configuration where drive redundancy is utilized. One of your drives goes down and you need to replace it but can’t shut down the system. With an external removable drive chassis you pull out the drive cage, replace the hard drive and slide it back into the housing. Set the RAID adapter to rebuild the array and everything’s back to normal. While this “mission critical” scenario may sound like it would never apply to your business, most offices with more than 10 employees can’t afford to shut the server down for 30 minutes. Now that we know how it works, let’s see how it’s made possible. One thing we know about IDE hard drives is never unplug any cables when the system’s running. Hot swapping is accomplished this way; the key lock has to be engaged for the unit to receive power, so when you unlock it to remove the cage power is cut and the drive is protected. Simple in use and circumvents any problems. Of course I didn’t read the manual and couldn’t figure out why the drives weren’t powering up after I installed them. Live and learn. When used in conjunction with the SuperCheck monitoring software, you can see full status details on the chassis including fan RPM and drive temperature. Keep in mind that these are a great accompaniment to the SuperTrak series, and Promise bundles them together and calls them the Pro series. The only drawback is price; around $130 each, which is way too much. If you can pick up a SuperTrak100 Pro kit for around $900 which includes the SuperTrak100 and three SuperSwap chassis. Editors note: this review was migrated from the old eBabble.net site and the photos updated. Originally published March 9th 2001.